Columbus, Ohio's ROBOT LORDS OF TOKYO have announced that Rick Wartell, who makes up one half of the legendary guitar duo in U.S. doom masters TROUBLE, will make a special guest appearance on their next album. The ROBOT LORDS is a songwriting duo consisting of Rick Ritzler (drums, guitar) and Paul Jones (vocals, guitar), who utilize a "PROBOT-like" approach by utilizing a variety of special guest players. Their music has been described by critics as "classic southern-doom-groove metal topped by blistering solos." "I've made it a point in pretty much every interview I've done to make it clear that TROUBLE is a massively important influence on me," says Ritzler. "Rick Wartell and Bruce Franklin have the single most devastating live guitar tone I've ever heard, period. It's beyond an honor to know we'll be working with Rick." 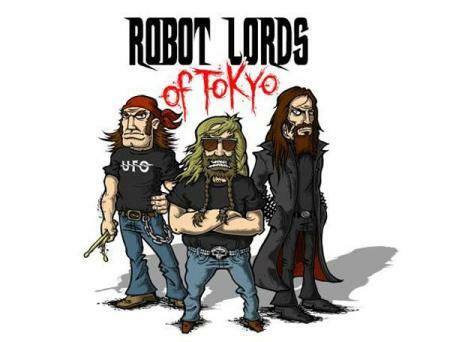 ROBOT LORDS OF TOKYO is currently promoting its second CD, "Whiskey, Blood & Napalm", released at the end of 2008. Guest six-stringers on the record include Steve Theado (AMERICAN DOG), Steve Pollick (ex-ICARUS WITCH, ORDER OF NINE), Rob Johnson (MAGNITUDE 9) and instrumental shred great Neil Zaza. For more information, visit www.myspace.com/robotlords.